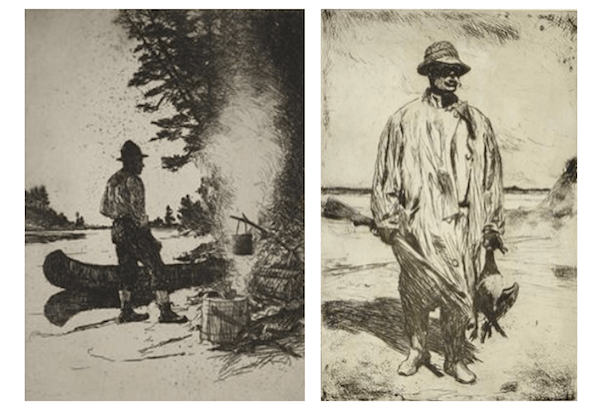 The shear impressionistic force of Frank W. Benson's sporting artworks make them hard to forget. You are swept so far away, so quickly by their gripping depth, it feels a bit like gazing up at an unexpected solar eclipse. Light strikes first, spreading edge-to-edge across the water like a blanket as expansive as the sky that opens up into infinity. Thin horizons and rising mountain ranges continue on like a looking-glass-world traveling well beyond their paper margins. Benson tucks his passion for the outdoors tightly under the shadow of every birds wing and sinks heavily like a stone around a lone fishermans canoe. We've selected a few of Bensons dazzling works on paper from Copley Fine Art Auctions upcoming Winter Sale catalog, live auction on February 17th to get lost in his great land-escapes. 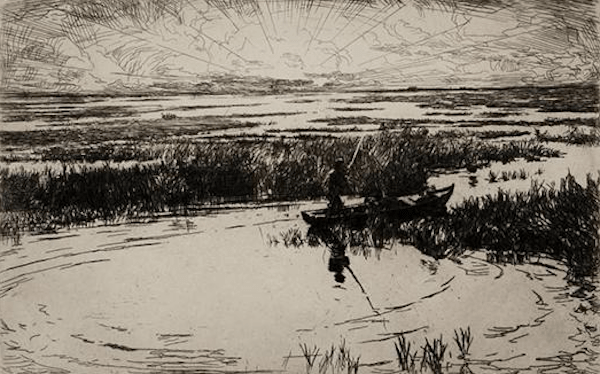 Frank W. Benson was born in Salem, Massachusetts in 1862 and would live most of his life in New England gaining critical acclaim for his exceptional, artistic skills. He would first study at Bostons Museum School and eventually leave to study abroad in 1883 at the Academie Julian in Paris where he would also spend time traveling by the seaside in Brittany and England. Upon his return from Europe, Benson opened a studio on Chestnut Street in Salem where he painted spectacular oil portraits of his family and friends. His notable talent attracted Boston's Museum School where in 1889 he would begin his appointment as a drawing instructor. Unsurprisingly, Bensons influence would inspire his students to win numerous prizes and national praise, sending a wave of applications to the institution. In addition to his students, Benson was awarded the Hallagarten Prize at the National Academy in New York in 1890, one of many future awards that would solidify his reputation as "America's Most Medalled Painter." Although, Benson is best known for elegant, sun filled canvass which capture his daughters sitting on hillsides, facing gusts of heavenly winds or dramatic subjects sitting in contemplative interiors, his belief that, "A man’s best chance to produce something which will please others is to represent as faithfully as he can what pleases him, in the way he likes it best...” swings the pendulum towards his portfolio of outdoor sporting arts. It wasn't until 1915, that he finally considered showing and producing the watercolors and etchings that had previously been put aside as hobby work. It didnt take long before his graceful, nostalgia for the natural world made a splash in New York's gallery scene; the demand for Benson's work on paper was so high that he reportedly hid artworks from studio visitors so he could send dealers enough printed editions for their inventory. 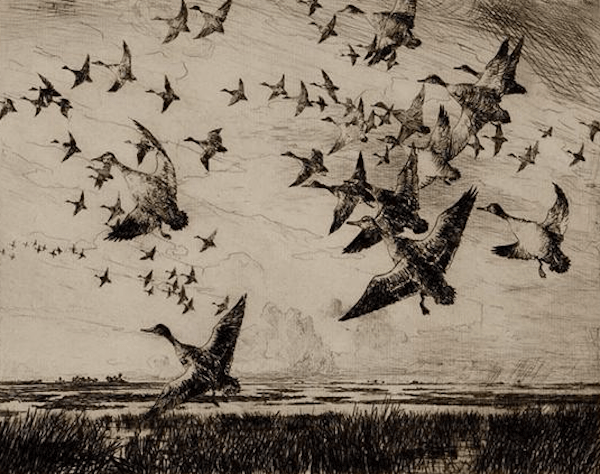 As a child, Benson would wander around the marshlands of Salem and observe scenes like synchronized, flocks of migrating birds, innocent ducklings learning to propel through the water and Yellowlegs projecting their beaks right into their own reflections. He imagined that one day he would become an Ornithological illustrator, like Audubon perhaps. Luckily, his artistic aspirations were broader and lead him to paint some of the most luminous oil portraits the art world has been graced with in conjunction with the eventual unveiling of his first love, the great outdoors. Benson frequently summered in and around New England to places like Newcastle, New Hampshire; Dublin, New Hampshire; Penobscot Bay, Maine and Cape Cod's Nauset Marsh. 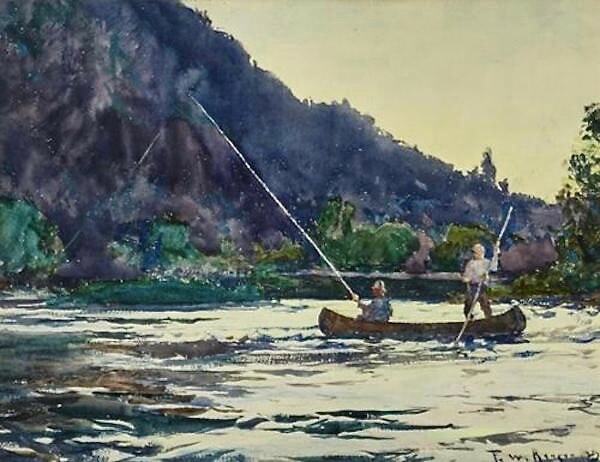 Above of all of these locations, Benson embraced his sporting art most intensely during his salmon fishing expeditions in Canadas Gaspé Peninsula; a place which would inspire him to produce over 500 watercolors. Colliding black lines whirl together to encapsulate spellbound, figurative etchings. 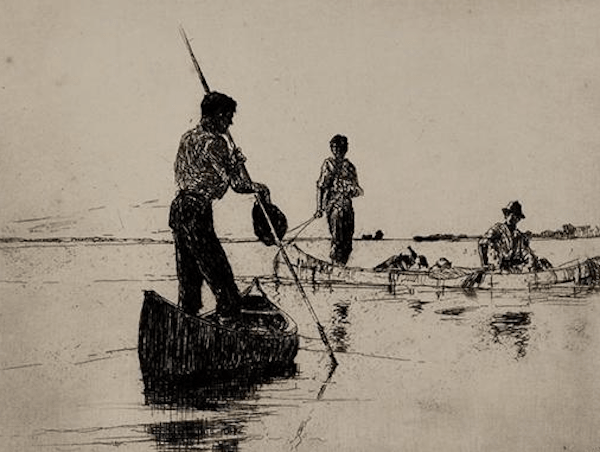 Illustrations translate true ruggedness, wither it be a man tending to his fire, gripping the catch of the day or fighting against strong river currents. 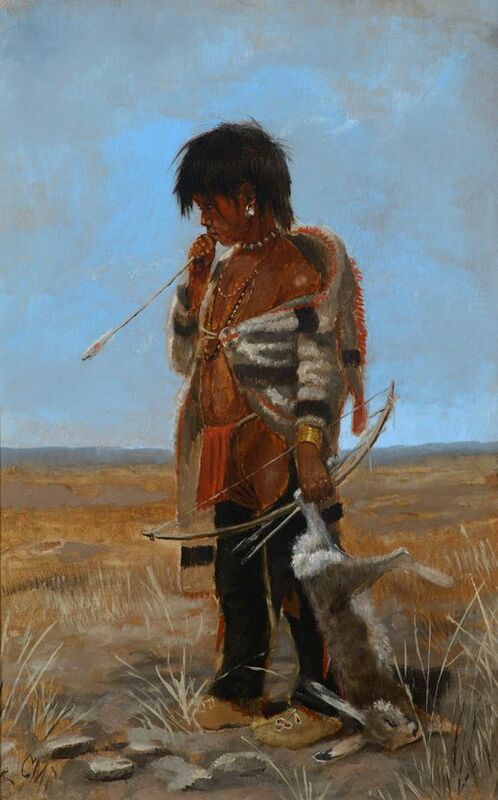 His confident mark-making and intimate characterization of his subjects rivals the likes of artists such as Winslow Homer and sets a masterful tone for his subjects; hunting guides, his two brother in-laws or perhaps projections of Benson himself who was, after all, descendant from a long line of sea captains. His intuitive fixation with water is made abundantly clear as he doesnt shy away from expressing the hundreds of illusions reflecting atop the complicated properties of water alone. 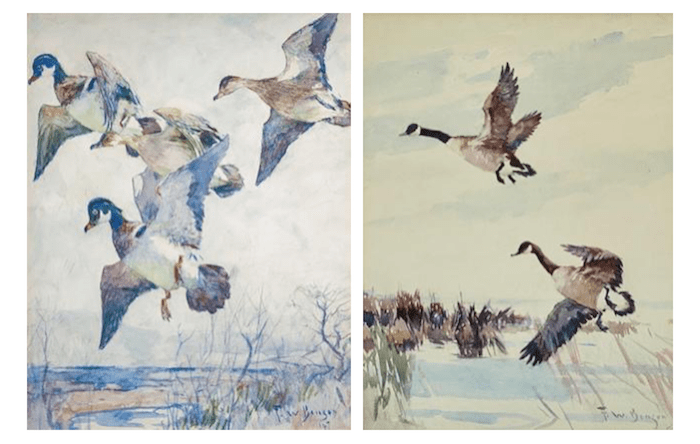 Click here to view the full auction catalog and see more of the artists upcoming works to be auctioned at Copley Fine Art Auctions, The Winter Sale on February 17th.